We love what we do, and the opportunity we have to enhance and improve properties by creating, staging and demonstrating lifestyles for potential buyers. Each property has a story, and our job is to tell it. One of our favorite activities is to visit a property and begin to develop its storyline before we start staging. We consider the community, the targeted buyer, and the property itself as we allow our ideas to unfold and envision the style that will best tell the story. If you don’t already know, we are a family real estate business, partnered with my husband, Jordan, and daughter, Ashley. Jordan is an agent for Keller Williams Luxury, and Ashley and I are the staging and property styling specialists. A running joke in our family is that it all projects start with a throw pillow since this was often the jumping off point in any of our renovation or redesign projects. 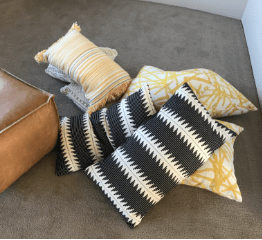 Apparently, this approach has rubbed off on Ashley, as she too finds a good throw pillow almost irresistible, and, more often than not, the inspiration behind our property styling projects. Since we carry our own inventory, and also make at least a few new purchases for each particular project, we need to be prudent about how we spend those dollars. Quality can never be sacrificed when staging a home to create a lifestyle. Few things scream blah louder than a poor quality or ugly throw pillow. The right choice can dramatically make or break the style of a room, and we want potential buyers talking about how fantastic a space looks and envisioning themselves living there. But, not every budget allows for a trip to Z Gallerie or an order placed with Frontgate to achieve throw pillow happiness. We’ve scoured numerous resources and want to share them with you, so you too can find your throw pillow bliss, saving you time and money when sprucing up the home you are selling. Here are some of our favorite pillow places that offer the style, taste, and sophistication we seek in both our personal and real estate projects. Home Goods – Rarely does a week go by that we are not seen in the pillow aisle of Home Goods. With three locations near us, if we don’t find what we want at one, it’s on to the next. It’s not unusual for our SUV to be filled with the day’s pillow catch. Living Spaces – Our first stop is the sale rack. Some of our best finds have been discovered here. Don’t be surprised if you spy a pillow seen at Z Gallerie, but for a lot less. Don’t restrict your pillow shopping to only the pillow section. Often the right pillow can be found lounging on a sofa or chair on the display floor. 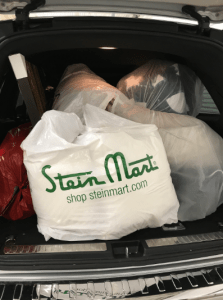 Stein Mart – You have to love Stein Mart! If you don’t, you are missing out (at least on some good pillow finds). Although they may not offer the depth of some of the other stores, they often have more interesting designs, sizes and unique options to satisfy your inner stylist. Target – Target has pleased us recently with a few of their new items. Although limited, they have introduced some trendier accessories and accent pieces, making a refresh affordable and fun. If possible, avoid ordering online and visit the store in person. For my personal master bedroom refresh, I found two pillows in a store but wanted a third, which I ordered online. The pillow took two weeks to arrive, and had a large slub in the fabric, making it unusable. What a disappointment! Plus, I am fanatical about how a throw pillow not only looks but functions. It has to have just the right amount and type of fill; it has to squish and smoosh a certain way, and look fantastic; a tall order! We have the same high standards for pillows we use in staging, so unless we are already familiar with the brand, we avoid purchasing pillows online. However, there are a couple of exceptions to this rule and, when nothing else will do, and your budget does have a little wiggle room, take the plunge. 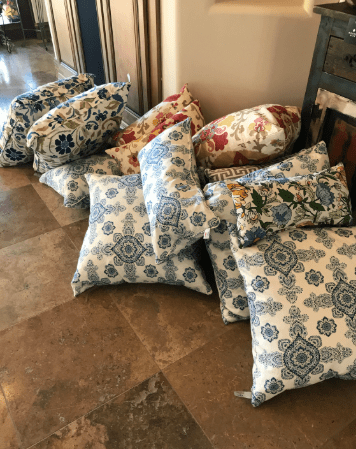 Z Gallerie – Their pillows are awesome! Large, bold and interesting, they have just the right amount of fluff power. Watch for sales, but if you find a pillow you must have, this splurge is well worth it! Frontgate – frontgate.com – Pricey, pricey, pricey, but they do have sales and a friendly return policy. Sign up for their email communications, and you will be rewarded at various times during the year with sitewide discounts on selected items. When budgets are tight and only online will do, Wayfair – wayfair.com and Joss and Main – are good options, both of which we have used. A careful reading of the reviews will guide you in the right direction, and their return policy will prevent you from living with a mistake.